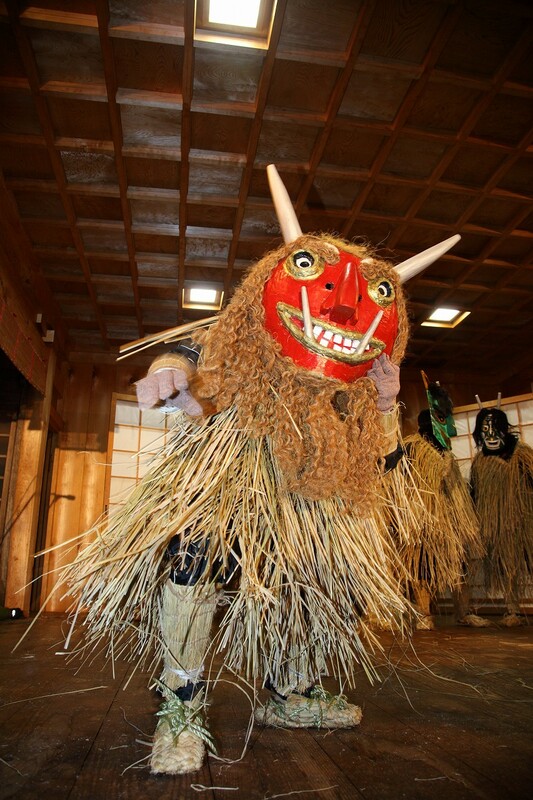 The Namahage Sedo Festival is a combination of the Shinto “Saitousai” ritual held on January 3rd at Shinzan Shrine in Kitaura, Oga City and a traditional “Namahage” event begun in 1964 and held on the second Friday, Saturday and Sunday of February every year at Shinzan Shrine. 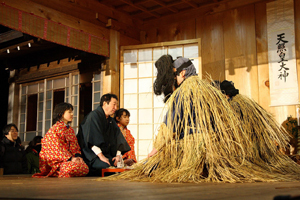 This festival starts at the grounds of Shinzan Shrine. 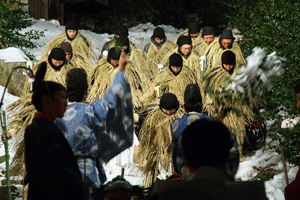 Under the light of the Sedo fire at Shinzan Shrine, after the “Yunomai” dedication of Haraikagura sacred dance (unique to the Oga area), and “Chinkamasai”, an old Shinto traditional religious service using hot water in a pot, the Sedo Festival starts. 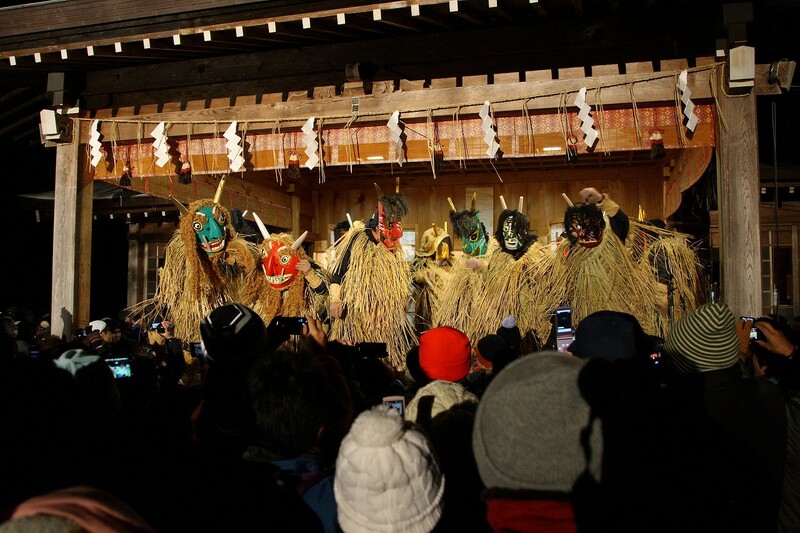 Young men are presented with masks which have been purified by a Shinto priest, and become Namahage. 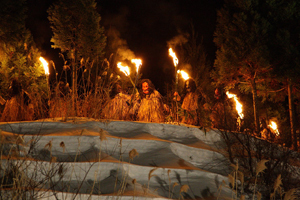 They then go back to the mountain, and a ceremony called “Namahage nyukon” (Namahage-spirit-investment) is held. 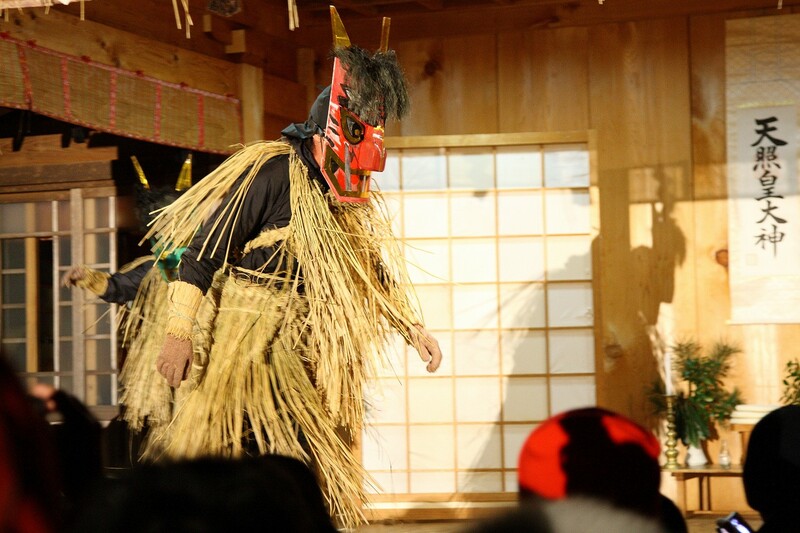 On stage at the shrine’s Kakuraden, some performances are held, including a reproduction of the Namahages’ New Years’ visits, “Sato no Namahage”, in which Namahage appear in different masks and costumes, and Namahage Daiko (Japanese drumming) as folk art. 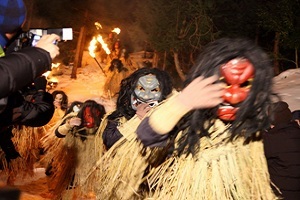 In front of the Sedo fire, Namahage dance music created by Baku Ishii (modern dancer) and his son, Kan Ishii (composer), is played dynamically. 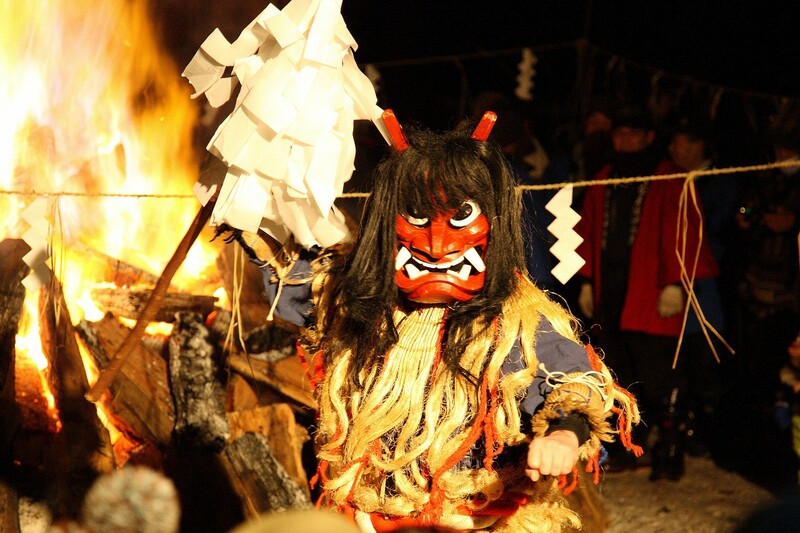 At the end of the festival, it’s fantastic to see the Namahage with torches coming down from the snowy mountain. After coming down the mountain, the Namahage walk around the shrine among the many visitors, and the festival ends. 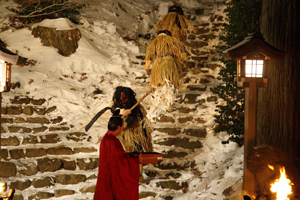 The Shinto priests dedicate Goma-mochi (rice cakes) which are roasted on the Sedo fire as an offering to the Namahage. 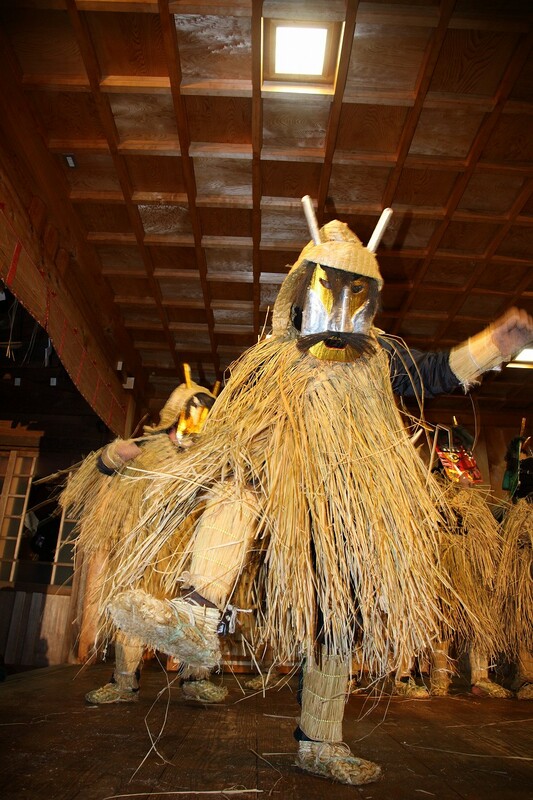 Then the Namahage return to the deep mountain where the God is. 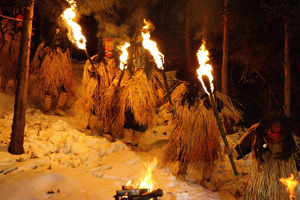 The Sedo Festival is the one of the principal winter festivals in the Tohoku area. 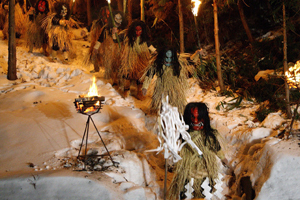 Collectively they are called the Michinoku Big 5 Snow Festivals, and also include the Yokote Kamakura, Hirosaki Castle Lantern Festival, Hachinohe Emburi, and Iwate Snow Festival. 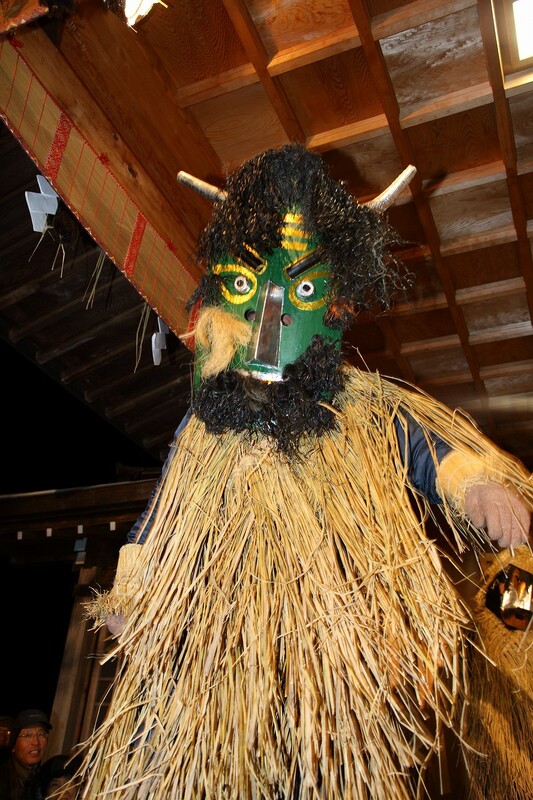 Namahage Sedo Festival is held at Shinzan Shrine in Oga City, Kitaura Shinzan. 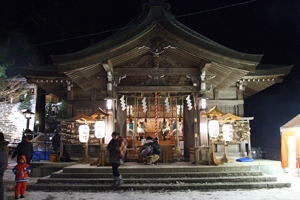 Shinzan Shrine is a place remembered in connection with Namahage and was built in the era of the 12th emperor, Keiko. 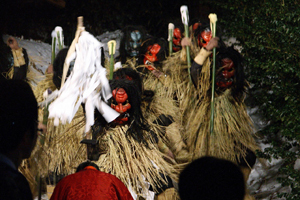 Young men who will act Namahage get purified by a Shinto priest at the gate of the shrine. 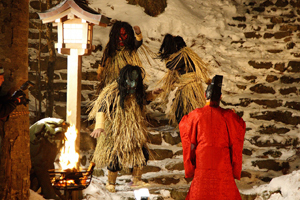 They receive the masks of the Namahage which contain the spirit of the God, then become Namahage and return to the mountain. 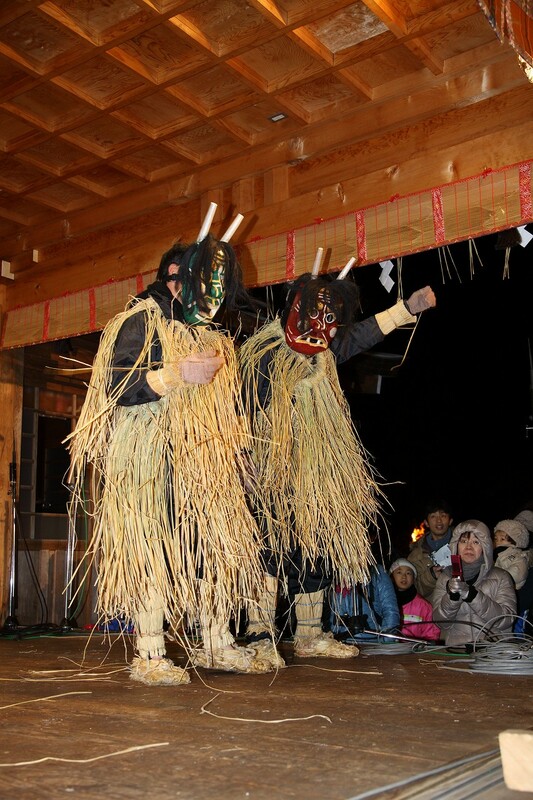 n New Year’s Eve in Oga area, a traditional event called “Oga no Namahage” (Namahage in Oga) in which Namahage visit and go from house to house is reproduced at Kaguraden. 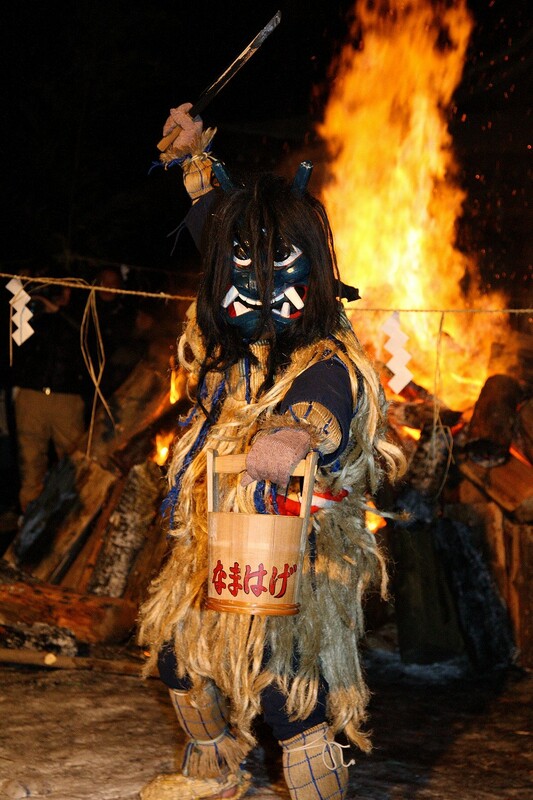 Namahage events are different in each area of Oga, with varying costumes, masks and rules. Some of them are displayed in the Kaguraden. 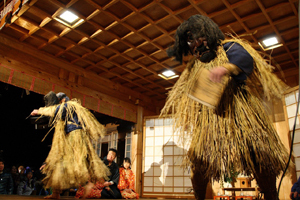 Namahage Odori is performed in front of the Sedo fire at the center of the shrine. It was created in 1961 by Baku Ishii (modern dancer) from Akita, and his son, Kan Ishii (composer). 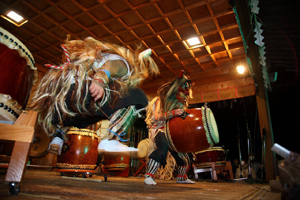 Namahage Daiko is a folk art which is a collaboration between Namahage and Japanese drummers. 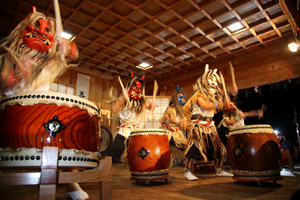 The rhythm of drums and the Namahage’s shouts from the Kaguraden are resonant in the festival. 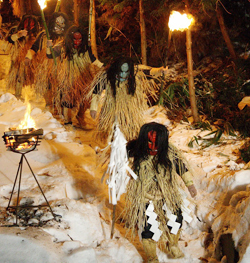 Namahage with torches show up from the dark side of the mountain and descend on the shrine. Then they walk around the shrine in front of the audience. 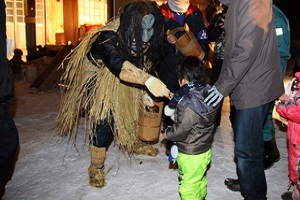 The fantastic Sedo Festival comes to an end. 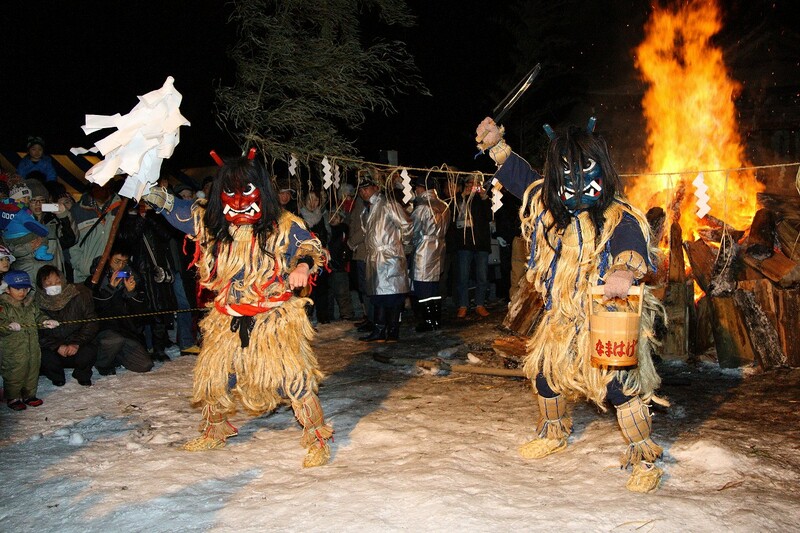 The Shinto priests dedicate Goma-mochi roasted on the Sedo fire to Namahage; the Namahage can’t touch the mochi easily and move around. 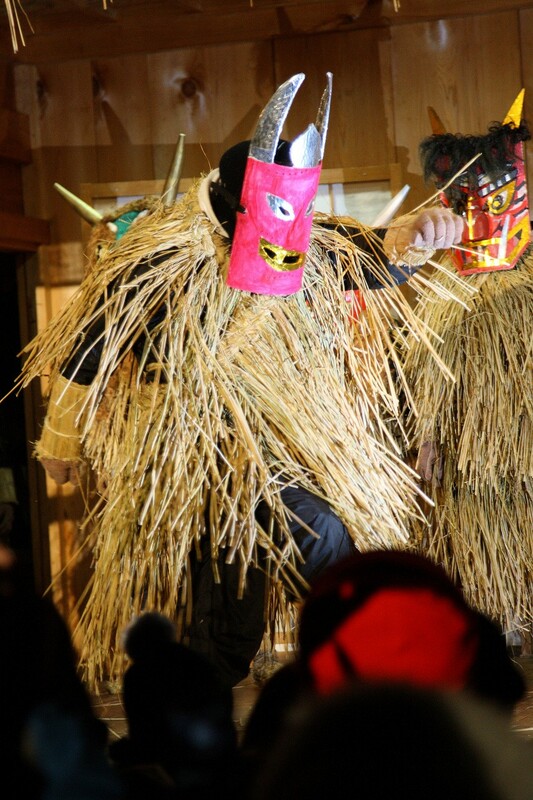 When Namahage have finally received the Goma-mochi, they go back to the mountain where the God is. 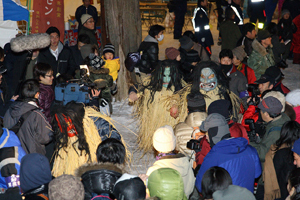 The cut Goma-mochi are distributed to the audience by the Namahage in front of the kaguraden. These rice cakes are said to be good for preventing fires. 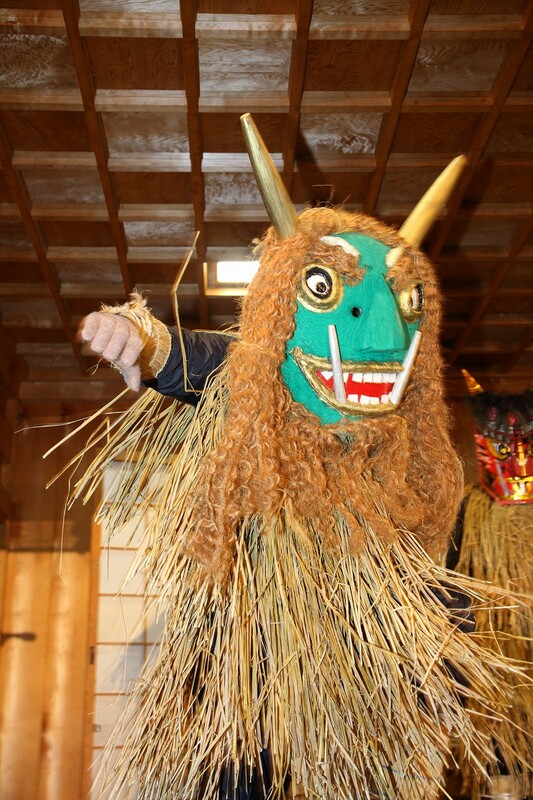 ■ The Namahage of Oga were designated as a significant intangible folk cultural asset of the country in 1978 using the name written in Katakana; however, the name is also written in Hiragana. Funagawa-aza-izumidai 66-1, Oga City, Akita, 010-0595, JAPAN. Copyright (C) 2012 NAMAHAGE. All Rights Reserved.